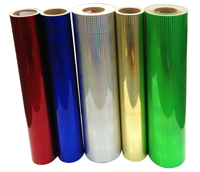 On this page, you will find all the R-Tape decorative series metallized films we carry. 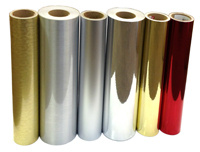 For other brands of metallized films, see under Metallized Film. Below are the products we have in stock. Just click the category link to see product specifications and price list. R Tape VinylEfx Multi-lens (FDC 2822), silver printable (SM-V357), gold (printable)/red/blue/galaxy/raspberry (SM-V358) - for window graphics, interior decorations, etc. 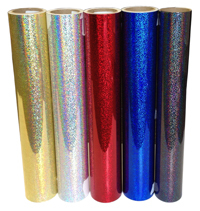 R Tape VinylEfx Metal Flake decorative vinyl (FDC 2824), silver printable (SM-V352), gold/red/blue/galaxy (SM-V353) - for window graphics, interior decorations, etc. R Tape VinylEfx Mosaic decorative vinyl (FDC 2825), silver printable (SM-V359), gold/red/blue/green (SM-V360) - for window graphics, interior decorations, etc. R Tape VinylEfx Chrome decorative vinyl (FDC 2826), silver colors (SM-V361), other colors (SM-V362), mostly printable - for window graphics, interior decorations, etc. R Tape VinylEfx Chrome Outdoor Durable decorative vinyl (FDC 4826), mostly printable - for window graphics, outdoor applications, etc. R Tape VinylEfx Diamond Plate decorative vinyl, printable (FDC 2827, SM-V364) - for window graphics, interior decorations, etc. R Tape VinylEfx Diamond Plate Outdoor Durable decorative vinyl, printable (FDC 4827, SM-V365) - for window graphics, outdoor applications, etc. R Tape VinylEfx Brite Overall decorative vinyl, hologram, printable (FDC 2831, SM-V355) - for window graphics, interior decorations, etc. R Tape VinylEfx Brite Overall Outdoor Durable decorative vinyl, printable (FDC 4831, SM-V366) - for window graphics, outdoor applications, etc. FDC 2822 series is R Tape VinylEfx 1 3/8" Multi-Lens pattern Decorative Series film. VinylEfx products are metallized PVC films designed to give the appearance of metallic materials or finishes and add special effects to promotional graphics, signage and decals. Decorative series films provide limited exterior durability. FDC 2824 is R Tape VinylEfx Metal Flake pattern Decorative Series film. VinylEfx products are metallized PVC films designed to give the appearance of metallic materials or finishes and add special effects to promotional graphics, signage and decals. Decorative series films provide limited exterior durability. FDC 2825 is R Tape VinylEfx® Mosaic pattern Decorative Series film. VinylEfx products are metallized PVC films designed to give the appearance of metallic materials or finishes and add special effects to promotional graphics, signage and decals. Decorative series films provide limited exterior durability. 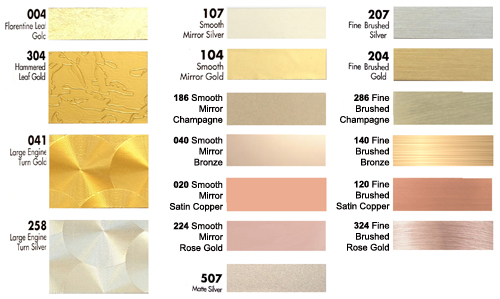 FDC series 2826 is R Tape VinylEfx Mirror or Fine Brush or Florentine Leaf pattern Decorative Series film. VinylEfx products are metallized PVC films designed to give the appearance of metallic materials or finishes and add special effects to promotional graphics, signage and decals. Decorative series films provide limited exterior durability. 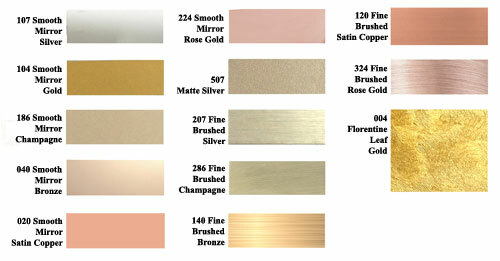 New colors: Smooth Mirror Champagne (186), Smooth Mirror Satin Copper (020), Smooth Mirror Bronze (040), Smooth Mirror Rose Gold (224), Fine Brushed Champagne (286), Fine Brushed Satin Copper (120), Fine Brushed Bronze (140), Fine Brushed Rose Gold (324). These 8 new colors have recently been added to this series. FDC 2827 series is R Tape VinylEfx® Diamond Plate™ pattern Decorative Series film. VinylEfx products are metallized PVC films designed to give the appearance of metallic materials or finishes and add special effects to promotional graphics, signage and decals. Decorative series films provide limited exterior durability. 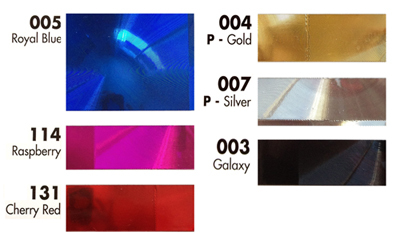 FDC 2831 series is R Tape VinylEfx® Brite Overall™ hologram pattern Decorative Series film. VinylEfx products are metallized PVC films designed to give the appearance of metallic materials or finishes and add special effects to promotional graphics, signage and decals. Decorative series films provide limited exterior durability. FDC series 4826 is R Tape VinylEfx Smooth Mirror, Fine Brush, Florentine Leaf, Large Engine Turn and Hammered Leaf pattern Decorative Series films. VinylEfx products are metallized PVC films designed to give the appearance of metallic materials or finishes and add special effects to general purpose graphics, signage and decals. This series films provide up to 3 years of outdoor durability. 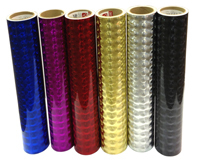 FDC 4827 series is R Tape VinylEfx® Diamond Plate™ pattern Decorative Series film. VinylEfx products are metallized PVC films designed to give the appearance of metallic materials or finishes and add special effects to general purpose graphics, signage and decals. The outdoor Durable series decorative series films provide up to 3 years of outdoor durability. FDC 4831 series is R Tape VinylEfx® Brite Overall™ pattern Decorative Series film. VinylEfx products are metallized PVC films designed to give the appearance of metallic materials or finishes and add special effects to general purpose graphics, signage and decals. The outdoor Durable series decorative series films provide up to 3 years of outdoor durability. There are many other FDC sign vinyl films available. Please contact us for more info.